Dentistry at Ramsin K. Davoud DDS is about so much more than your teeth and gums. Dr. Davoud and his team see you – not just your set of symptoms. We understand that dental anxiety is more the “norm” than the “exception.” Biological dental practices are the perfect environment for patients who fear “seeing the dentist.” Biological dentistry emphasizes patient comfort, a pleasant experience, and conservative and gentle techniques and treatment. We’ve also invested in lasers and other “light touch” technologies that help to put patients at ease. Sedation represents one of the biggest achievements in dentistry. Turlock sedation dental treatment at Dr. Davoud’s office provides a little extra help for those patients who need it. The American Dental Association’s Guidelines for the Use of Sedation and General Anesthesia define four methods of anxiety and pain control: minimal sedation, moderate sedation, deep sedation, and general anesthesia. Minimal sedation induces a minimally-depressed level of consciousness. Relaxing effects are often induced with a mix of nitrous oxide and oxygen (“laughing gas”), and patients are able to respond normally to tactile stimulation and verbal commands. On the other end of the spectrum, general anesthesia produces such a deep loss of consciousness that patients can’t be aroused with stimulation. Dr. Davoud uses oral conscious sedation. It’s generally considered to be a “moderate” sedative option. Consciousness is depressed. You’ll feel sleepy but retain your ability to respond to verbal commands. “Oral” refers to the calming pill that is prescribed to induce the sedative effects. Oral conscious sedation eliminates many sources of dental fear and anxiety. You remain in control during the procedure. 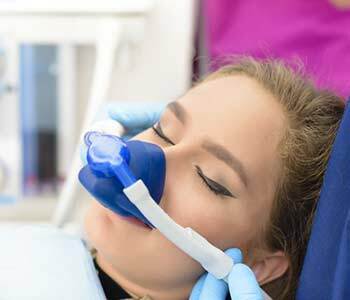 Unlike nitrous oxide, there is no need to wear an uncomfortable or restrictive mask. Unlike other deeper forms of sedation, the oral conscious method doesn’t require needles – as it is safely administered in pill form by mouth and not intravenously through a vein or as a shot into a muscle. While oral conscious sedation is safe (even for young patients! ), it’s important to follow the directions provided by your dentist. The first dose is taken the night before your treatment. This initial dose helps you to sleep well through the night, free of fear over your upcoming appointment. Quality rest also promotes a better, more relaxing experience at the dentist’s office. About an hour before your appointment, you’ll take the second dose. Because oral sedatives metabolize and take effect so quickly, you must have a friend or family member drive you to and from the office, or arrange for other forms of transportation. Sedatives affect each patient differently. As the medication takes effect, patients commonly feel drowsy. Some patients nod off, but can easily be awakened. You may feel a tingling sensation or heaviness in your limbs, and find that the world slows down. This type of sedation typically wears off quickly. After your driver takes you home, it’s important to refrain from intense physical activity, work, or operating heavy machinery for the rest of the day – until side effects like sluggishness wear off. The National Institute of Health reports around 15% of adults to have such severe dental anxiety that they avoid regular care at the dentist’s office. Researchers have also found individuals with high dental anxiety avoid emergency care in addition to routine care, such as in the event of a toothache. It’s not surprising that patients with high dental anxiety often experience significant oral health problems. Biological dentists like Dr. Davoud also appreciate that poor oral health has an adverse impact on quality of life, social and behavioral functioning, sleep quality, and is linked to other medical conditions; for example, untreated gum disease progresses to periodontitis. Researchers have found that advanced gum disease is associated with the development (or worsening) of conditions such as cardiovascular and respiratory diseases. Trust your oral and overall health to Ramsin K. Davoud DDS. Our office is designed with patient comfort and a pleasant experience at heart. Call (209) 666-8867 to schedule an appointment at the Turlock CA location.